for those of you who live at Hallam Fields, you are probably already aware that the contractors are now on site and ready to begin constructing the Community Hall. A schedule of works has been produced by the Contractors, Tanwood Construction Ltd and a copy is posted on the website, as you can see, so long as nothing goes wrong, it is hoped that the building will be completed on 19 September 2019 and ready to hire very soon after. The Parish Council approved a bid from Tanwood Construction Ltd and issued a Letter of Intent to enter into a Contract with them on 30 November 2018. The terms & conditions in the letter have been accepted and a signed copy of the agreement has now been received back enabling us to publish the news. The Contractors will take possession on Monday, 4 February 2019 and the date for completion shall be Friday, 2 August 2019. At last there will be some movement on the site and a much needed community hall will soon be available for hire. 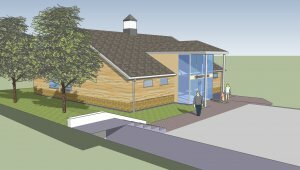 The Parish Council have taken a big step forward with the development of the Community Hall. It has taken some time to negotiate, but finally a Licence and a Schedule of Condition has been agreed by all parties and both documents were approved at the Parish Council meeting on Monday, 11 June 2018 and duly signed by the Chair of the Parish Council at that meeting. This will now enable the Parish Council's Project Manager for the development to send out to Tender for the Design & Build of the Community Hall. The approved Planning Application can be found on Charnwood Borough Councils Planning Explorer, the Planning Application Reference is: P/17/0666/2. Birstall Parish Council, after successfully negotiating a further £150,000 (with the valued assistance of the Palmer-Tomkinson Trust) to add to the £350,000 already set aside in the s.106 agreement, are now in a position to move forward with this much needed project. Regular meetings will take place with Parish Councillors on the Working Party Committee and external partners involved in the development. The Project Managers notes of the meetings will be published after they have been received by the Full Council, see below for these reports. 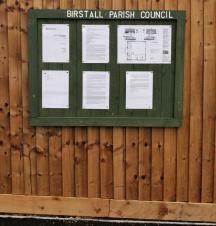 The Parish Council sought and received permission from Jelson's Ltd to affix a temporary notice board on the fence surrounding the site for the development of the Community Hall. This will be furnished with up to date information as it is received. We hope you find this helpful. For any enquiries regarding this project please telephone the Parish Council offices. Hallam Fields is an innovative and exciting new homes development in Birstall creating a whole new community which will become part of this popular and thriving suburb of Leicestershire. If you are a new resident to Birstall living at Hallam Fields, then first of all 'Welcome to Birstall' from all Parish Councillors and staff. If you are unsure of the facilities and services in Birstall, please browse our website or if you can't find what you are looking for, then please telephone the Parish Council office for further information and/or advice on 267 6191 or email: admin@birstallpc.org.uk. we look forward to hearing from you. The Section 106 agreements provide for payments from the developers to local authorities for new or enhanced community facilities. These are often phased with the progress of the development. The Cedars Academy have launched the new website for the Hallam Fields Primary School, which may be of interest to prospective parents.